Four formal structures define the Lunch Room, but also act as gateways to each different group within the building. The large skylight, metal halide lighting with a daylight color spectrum and 20′ tall trees liven up the room so that even the night shift has a bright and pleasant “day lit” space for their breaks. The 45,000 sq.ft., 24 hour a day, facility wraps around the centrally located breakroom and conference rooms so that employees can interact with each other with a minimum of wasted steps. 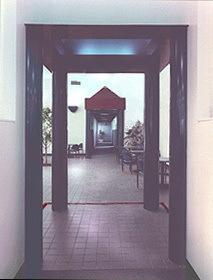 The Lobby was designed as the visitor gathering area and for central employee communications. Natural light illuminates the conference room on the other side of the glassblock walls and the yellow painted skylights brighten the office atmosphere. Yellow doors and matching window trim along with the confetti sprinkled black carpet pattern carry the Land of Oz theme – skipping down the yellow brick road toward the wizard – throughout the building which houses MIS. This 50,000 sq.ft. Distribution Center also housed sales offices and the company store. 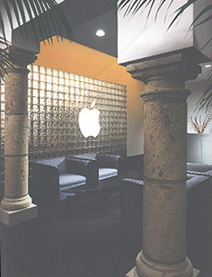 It was imperative that the lobby reflect Apple’s design philosophy yet be sturdy enough to withstand the heavy industrial traffic it would receive. 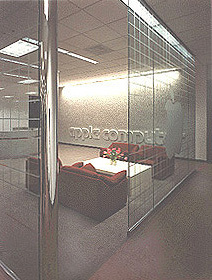 Glass separation panels between the lobby and the offices were sand-blasted with a light grid and Apple’s logo.